The top specialist nurseries of Plant Hunter’s Fairs return to the Archbishop’s Palace at Southwell Minster with a really great mix of plants and specialities to delight plant lovers of every level of experience. The independent nurseries from across the country each with their own unique range of lovingly grown plants will be setting out their stalls around the Education Garden turning it into a blaze of colour all frame by the ruined gables of the palace. It’s just the right time to pick up some Summer flowering plants to give your garden a boost and the nurseries will have just the right plant for your garden with nurseries specialising in plants of all sizes for a wide range of garden situations from hot sun to cool shade. If you need any help selecting the right plants for your garden the nursery folk are always happy to share their knowledge and experience. The gates open at 11am and the fair closes at 4pm and refreshments will be available through the day. 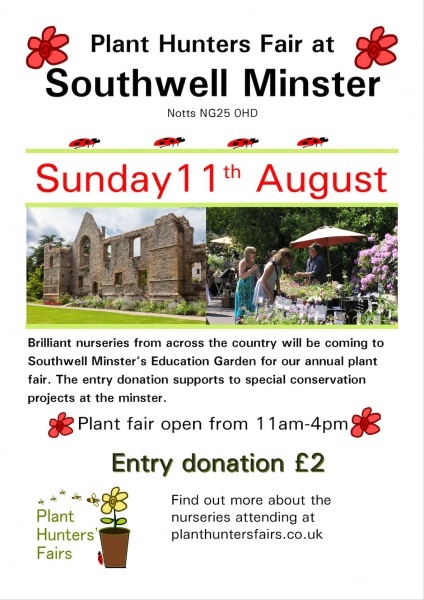 The £2.00 entry donation will be used to support Southwell Minster’s special projects. So, if you garden needs a late summer lift or you’ve been inspired to dig a new border then this is the place to find some different and exciting plants lovingly grown by passionate plantspeople and at the same time you will be helping conserve this wonderfully evocative place for the future.